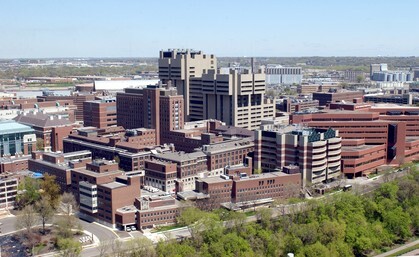 Welcome to the University of Minnesota Medical School Class of 1983 web site. Does anybody remember that cumulative pharmacology final? That was the day I was hit by a car while biking to class and I remember nothing other than telling the police officer that I needed to get to that exam. I'm excited about this upcoming reunion. (Save the date: 10/4/18) I’m in awe of the fact that it has been 35 years. I like knowing that we have had similar experiences and speak a similar language. In a way, we are birds of a feather. We wrote similar letters to get in and regardless of what we feel now, we are still called to help people. I feel called to give back to the medical school to help the young, eager, optimistic youngsters get off to a good start without too much debt. Current tuition is $38,628 for in-state and out-of-state tuition is $55,437. 1) What percent of our class is giving back or has donated to the medical school? Answer: In the 35 years since we have graduated from Medical School, 76% of us have made at least one gift, pledge or future estate commitment to either the Twin Cities or Duluth campus of the Medical School. On a yearly basis, this percentage is generally much lower. 2) How much money has the class of ’83 raised so far? Answer: In the 35 years since we have graduated from Medical School, more than $560,000 has been committed to the Medical School through outright gifts, pledges and/or future estate commitments to either the Twin Cities or Duluth campus. These gifts have been contributed to many different funds for a variety of purposes. We have been brainstorming about the best way to fundraise as there are many giving styles and many levels of capacity. There are going to be classmates who want to do a one time gift or a reoccurring gift or a lasting gift. The foundation people will tell you that all is welcome and that the U of MN Foundation is a 501C3 and tax deductible. Our 35th Reunion is a great opportunity to lead the way in giving back to the Medical School and set the bar for other classes to follow. I like to know where the money is going and that is why we introduce the idea of a specific fund from our class for a specific reason which is to reduce tuition for a student or students. It is called the Medical School Class of 1983 Scholarship. Our class will be able to identify exactly who is benefiting. Students would either have financial needs or be competitive academically high achieving students or both. Our student(s) would be able to give feedback to us and join us for reunions in the future as the class of 2023 meets on the same schedule as ours. A) Raise $5K to apply to tuition for one student for one year. B) Raise $20K to apply $5K to tuition for four years for one student. C) Commit to an endowed fund which requires $50,000. They grow overtime and hopefully members of the class would want to continue to support this endowed fund or include a legacy gift. This might be a worthy goal for our 40th reunion. That's the money part of the letter and the next part is the party part; please come! We plan to hear from a few classmates at dinner that dish out the good stuff; what they have learned over time. We call it wisdom. Wine, cheese and docs get better as they age. I can’t wait to hear what you have to say.